Aftermarket demand for automotive filters will rise 2.4% per year through 2021. The US will post the largest net gains, though Mexico will log the most rapid growth (albeit from a relatively small base), based on improving GDP and personal income levels; consumer education efforts that encourage filter replacement; and the comparative immaturity of the Mexican market. Oil and air intake filters will together account for the vast majority of aftermarket filter sales. 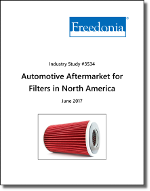 This study analyzes the North American aftermarket for automotive filters. Here “automotive” denotes light vehicles (i.e., passenger cars, light trucks, and vans). The aftermarket represents parts and components installed after the vehicle has left the factory. In this study, North America comprises the United States, Canada, and Mexico. All product sales figures provided in this report are given at the manufacturers’ level and do not include wholesale or retail mark-ups or installation costs. Excluded from consideration are chemical products such as transmission fluid, motor oil, and the like. To distinguish between parts that are produced by the original equipment manufacturer and those that are made by other companies, many automotive parts suppliers label the former as “OEM parts” or “OEM replacement parts,” while the latter are often referred to as “aftermarket parts.” In addition, components made by a vehicle manufacturer’s OEM component suppliers that are installed by dealer repair departments are sometimes referred to as original equipment service or original equipment supplier parts. For the purposes of this report, OEM replacement parts, OES parts, and aftermarket parts are all included in the automotive aftermarket, as long as these parts are utilized to repair or upgrade light vehicles in use. Aftermarket demand for automotive filters is examined by product, country, and major aftermarket service performer (garages and service stations, automobile dealerships, specialists, other professionals, and consumers/do-it-yourselfers) in US dollars at the manufacturers’ level. Historical data for 2006, 2011, and 2016 and forecasts for 2021 are presented in current US dollars. Historical data is adjusted to account for fluctuations in exchange rates; forecasts are not thus adjusted.